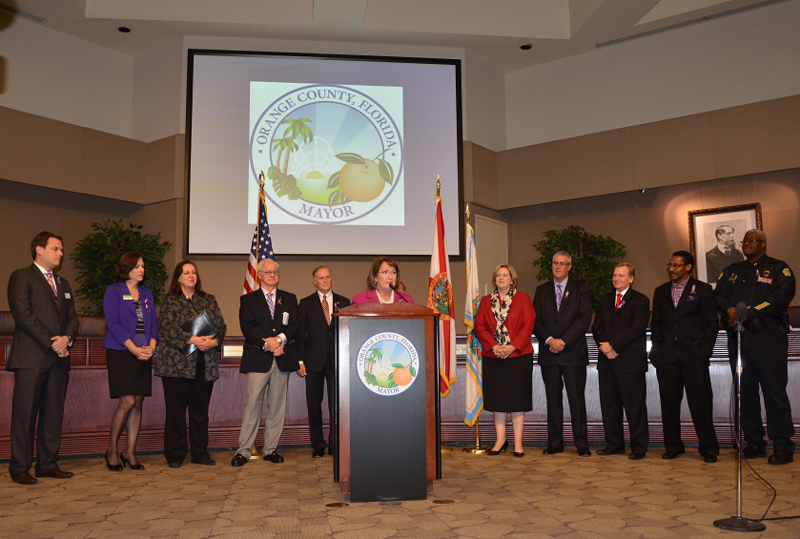 Orange County, FL – To symbolize that love should not hurt, the Orange County Domestic Violence Commission (DVC) held a news conference on Valentine’s Day. The news conference highlighted noteworthy achievements over the last year, including forthcoming legislation advocating for victims of domestic violence. Significant legislation regarding domestic violence is being introduced this session by Senator David Simmons, Florida Senate, District 10. One bill will ensure that victim’s addresses are kept confidential in court records. Another bill will allow prosecution of defendants who violate the “no contact” orders by making telephone calls from jail. The Clerk of Court has allowed Harbor House employees to serve as special deputy clerks to process affidavits of violations filed by survivors in injunction cases. In partnership with the Community Food and Outreach Center, Harbor House, the Department of Children and Families, and the Victim Service Center are in the planning phase of a Justice Drop-In Center. Harbor House has applied for an Orange County Safety Grant to address language barriers to survivors of domestic violence and has hired a full-time advocate to do outreach into the Haitian community. A variety of photos from the news conference are available for use by the media and are located on Flickr, http://www.flickr.com/photos/mayorteresajacobs/.